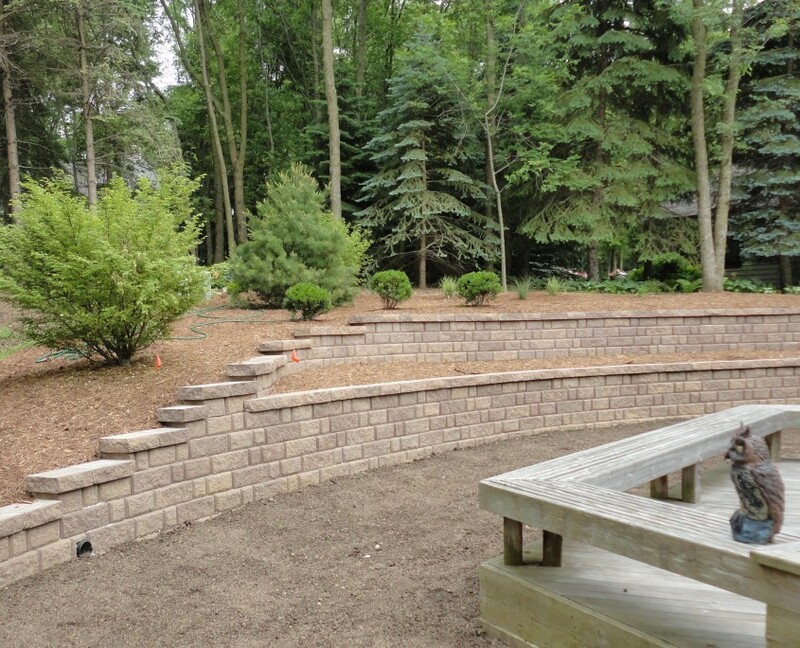 Koch Kuts is a lead provider of retaining wall installation & replacement services. 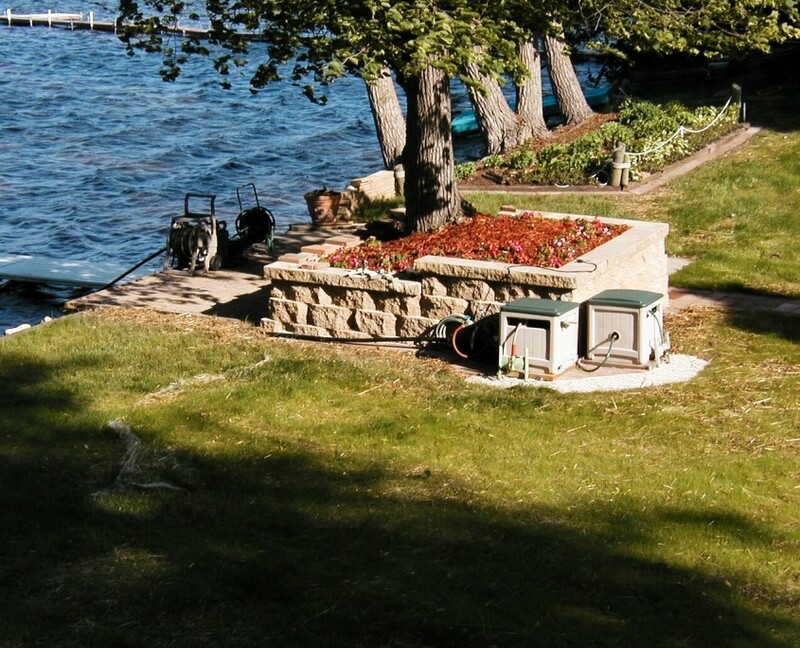 We’ve helped countless homeowners in Burlington & SE Wisconsin control landscape erosion, prevent property damage, and add curb appeal to their homes with high-quality retaining walls. 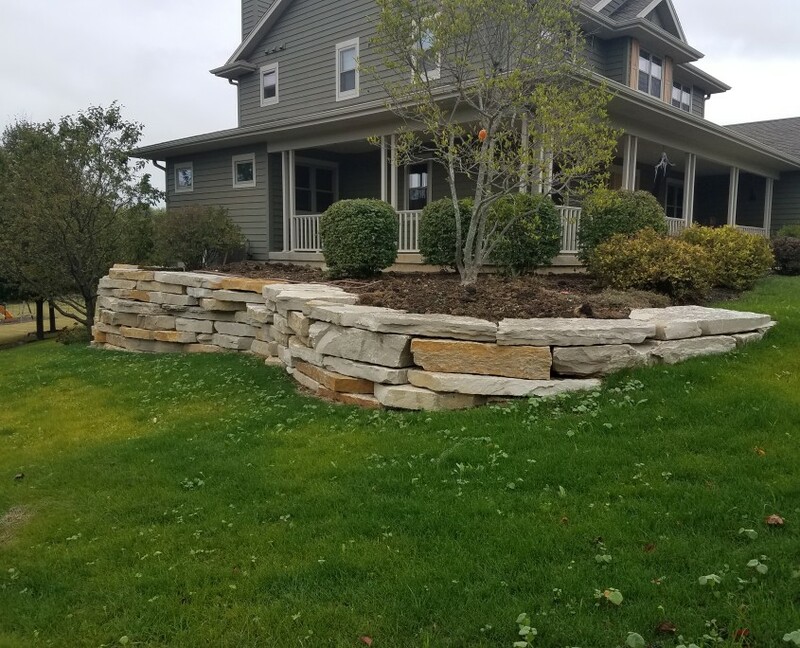 Our hardscape professionals have the skills to install retaining walls on a hillside or slope, next to a house, under a deck, around a pool or patio, next to driveways, and more. 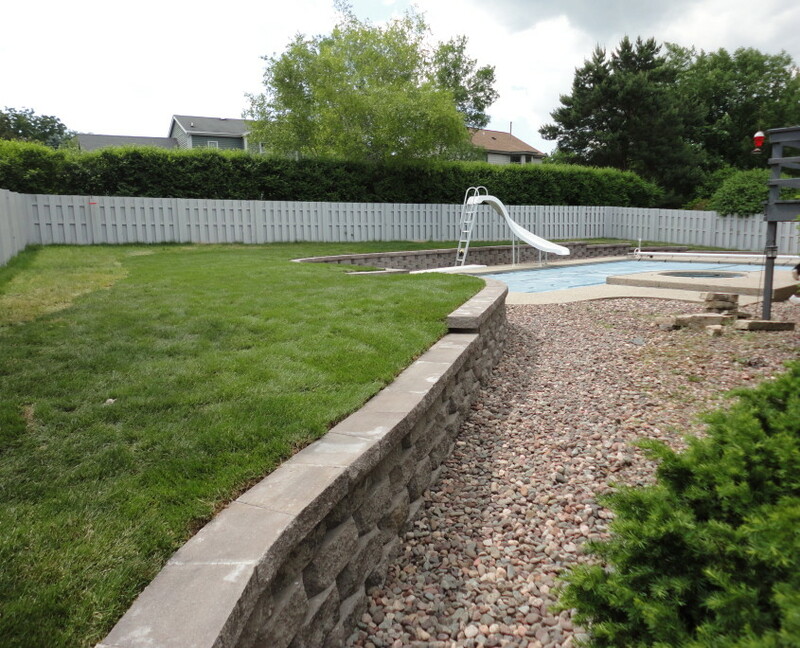 In our before & after photos below, you’ll get a first-hand look at some of the retaining walls we’ve installed. 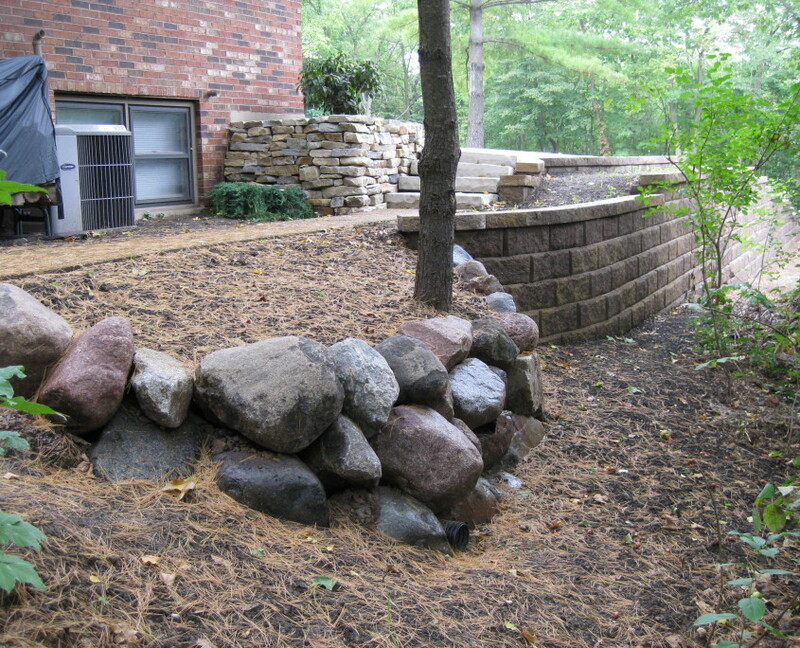 You’ll also get an idea of your retaining wall options in regards to style, stone type, color, and size. 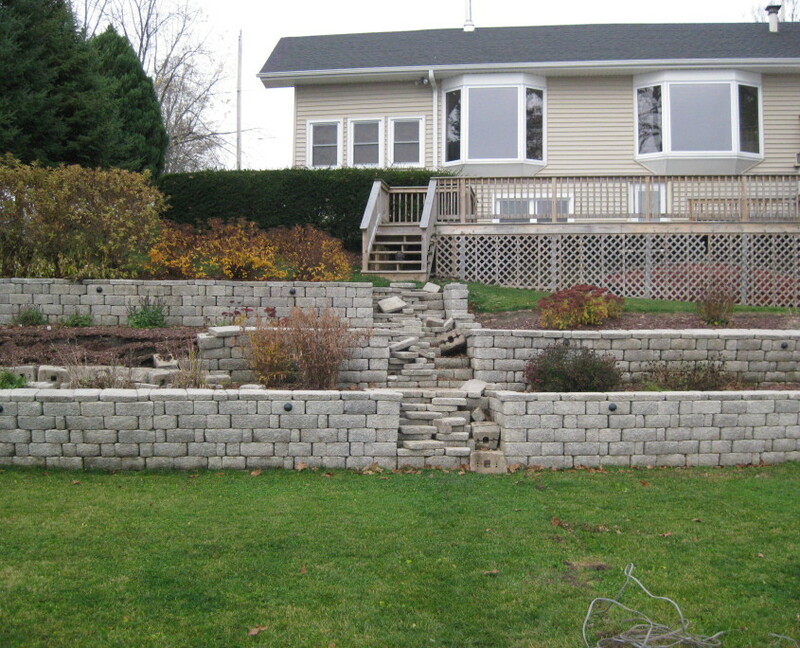 Get a retaining wall estimate – contact us! 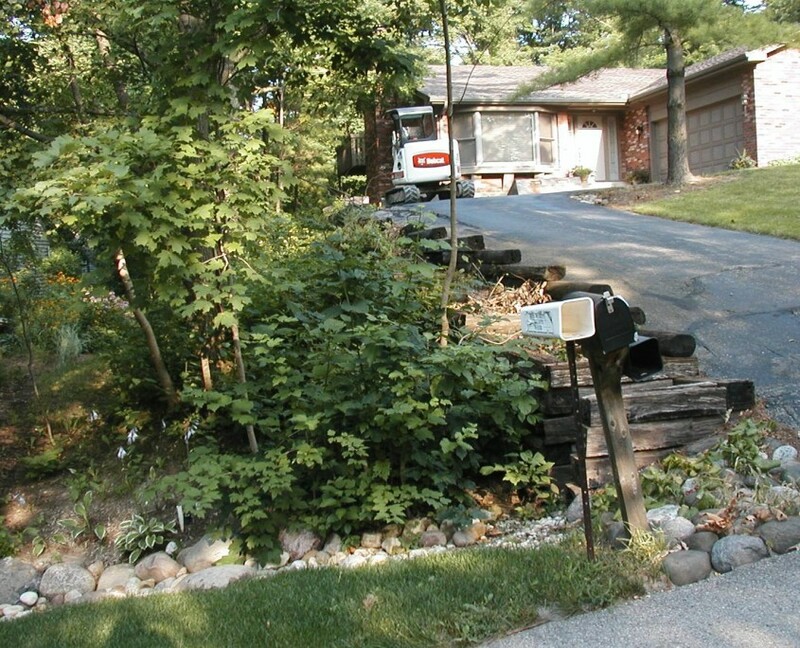 The boulder retaining wall behind this home was old and ineffective before Koch Kuts stepped in. 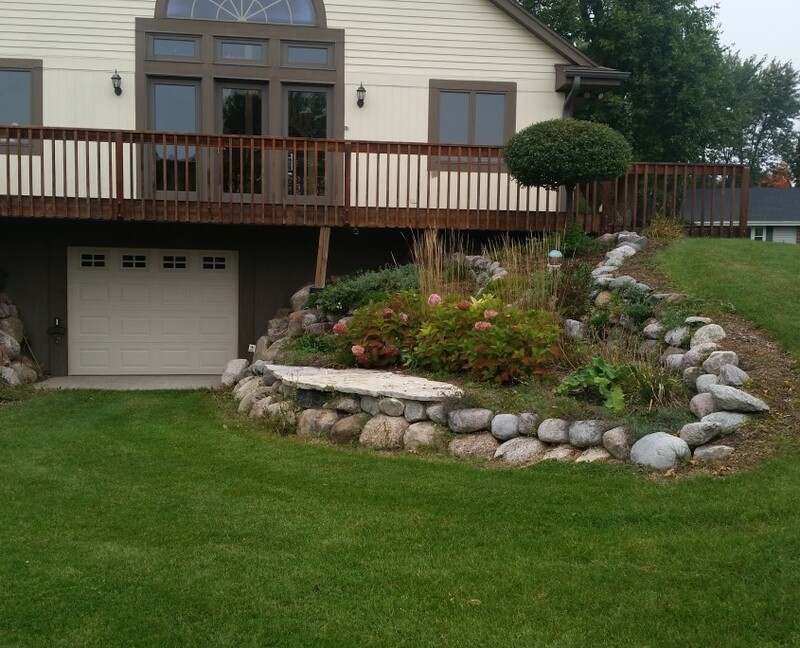 We installed a new stone retaining wall that maximizes the space under their deck. 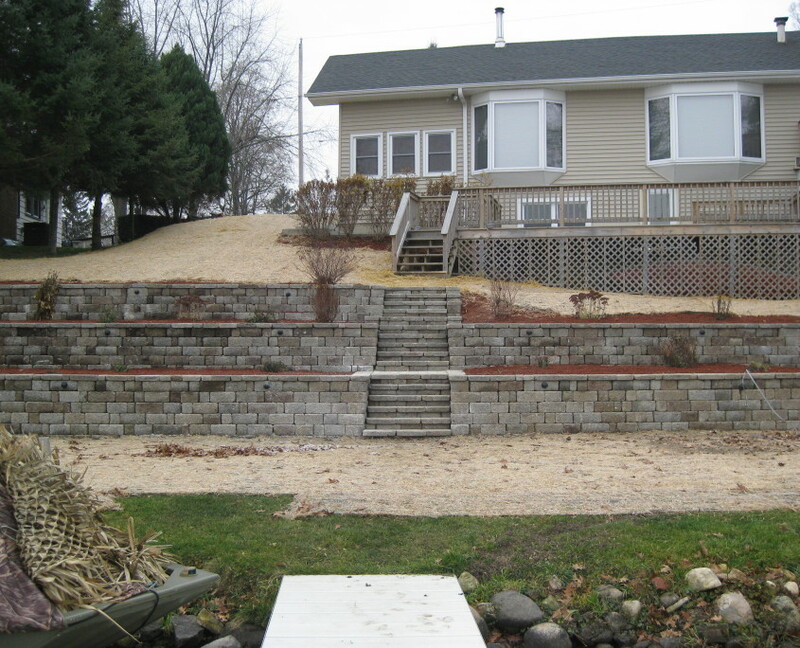 We also replaced the retaining wall that ran around the side of this house too. 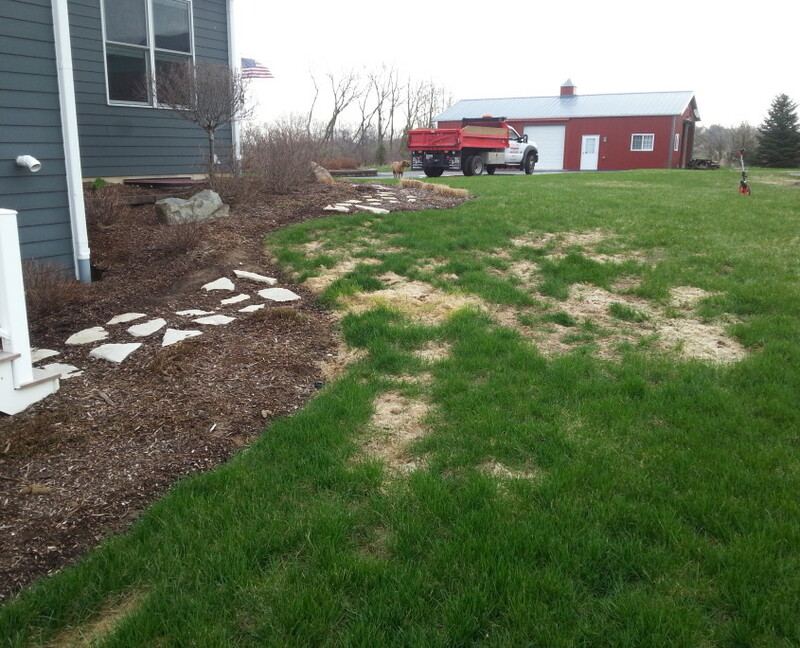 The new wall helps better combat landscape erosion. 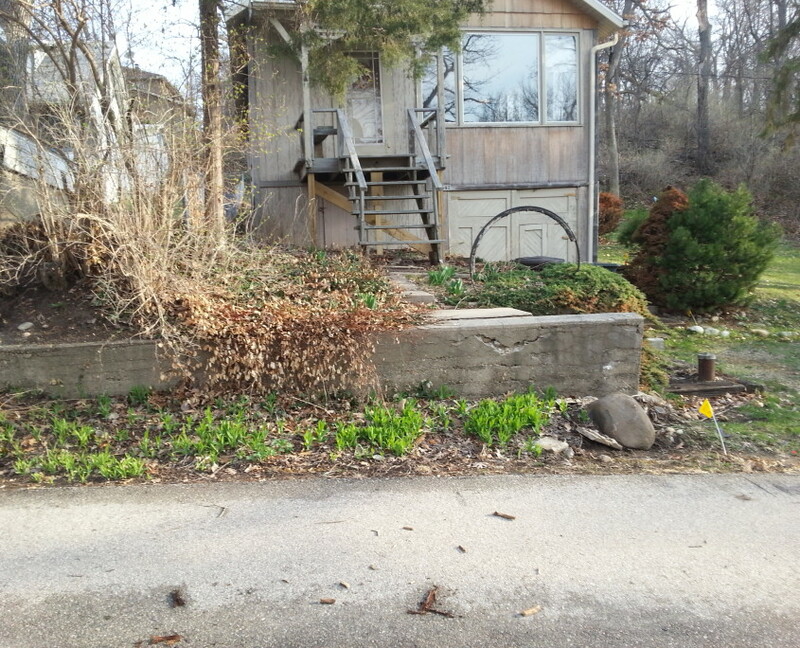 The same retaining wall on the side of this house wrapped around to the front yard. 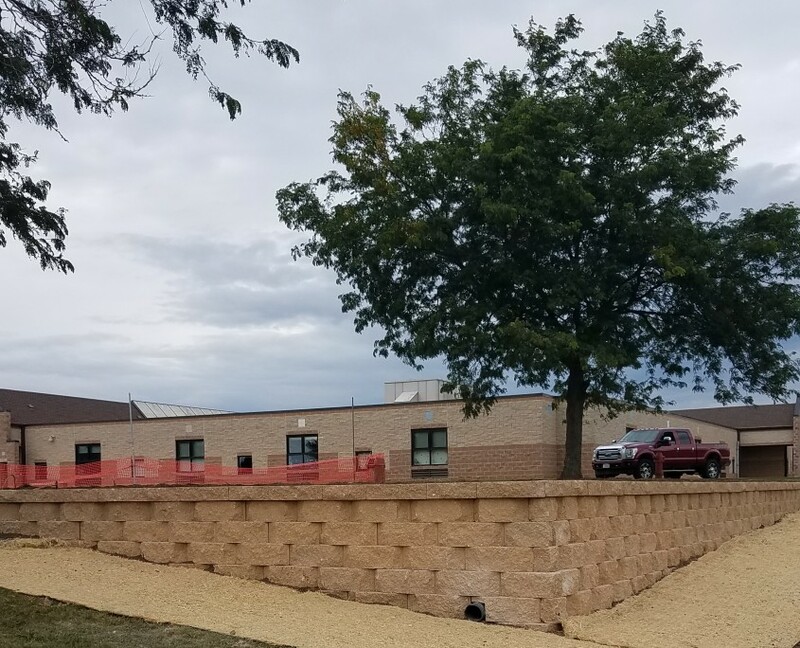 We made sure the new wall was visually appealing and provided the right support for their shrubbery. 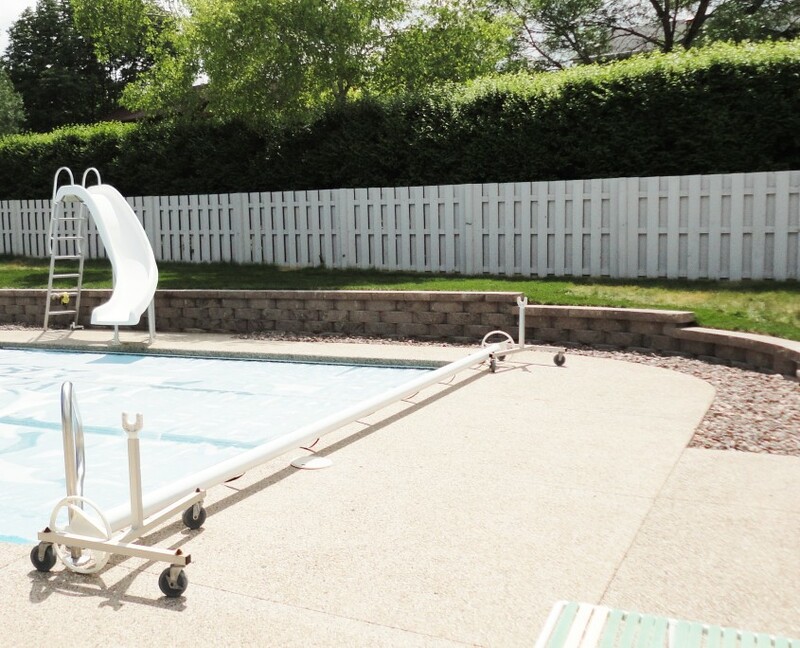 Retaining walls are a great way to maximize your backyard space; and the wall around this pool is a great example of how. 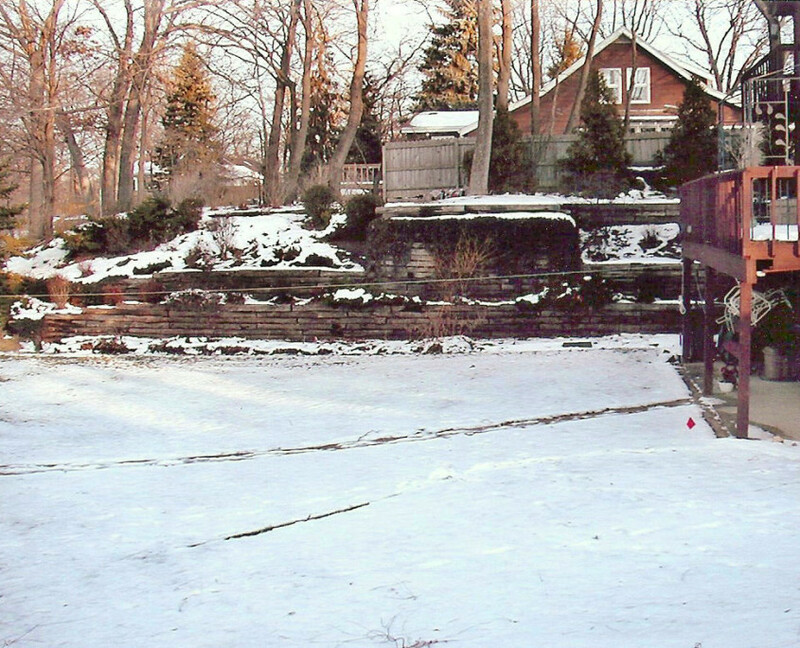 You can see in the before image that the old retaining wall was no longer standing up straight. We replaced it with a solution they can depend on for years to come. 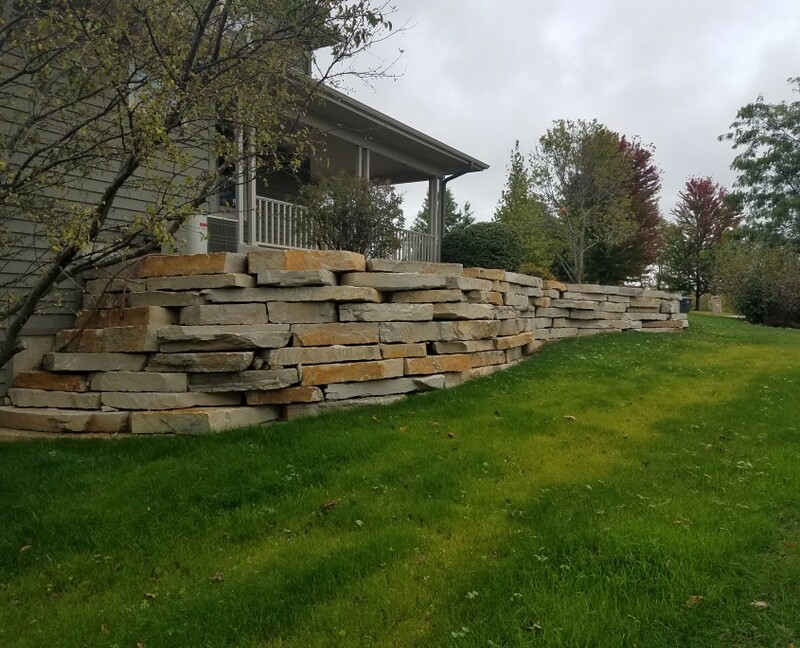 If your old retaining wall is starting to look like the one in our before photos, give us a call for an estimate on retaining wall replacement. 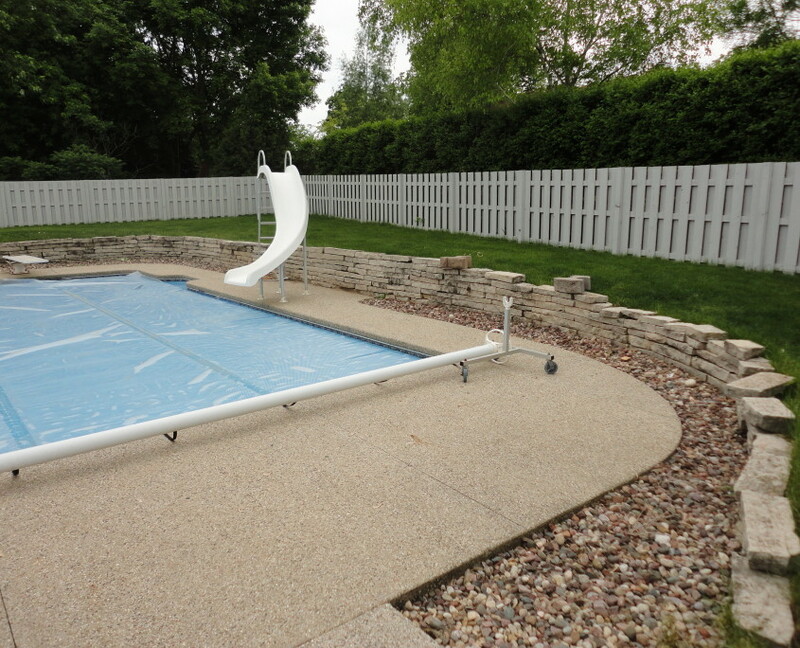 We installed this beautiful cement retaining wall around the pool; and we can do the same for you too. 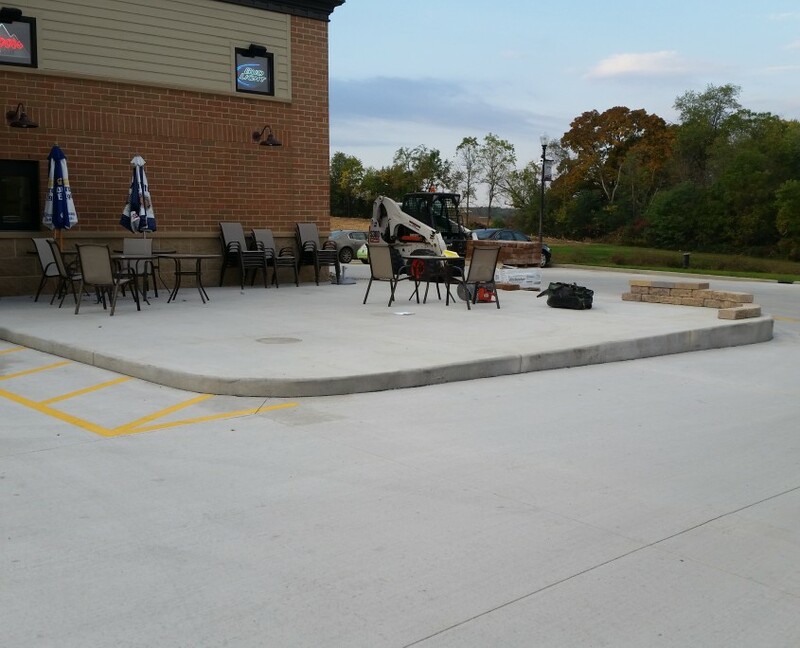 This restaurant/bar was ready to add an outdoor patio for their patrons. 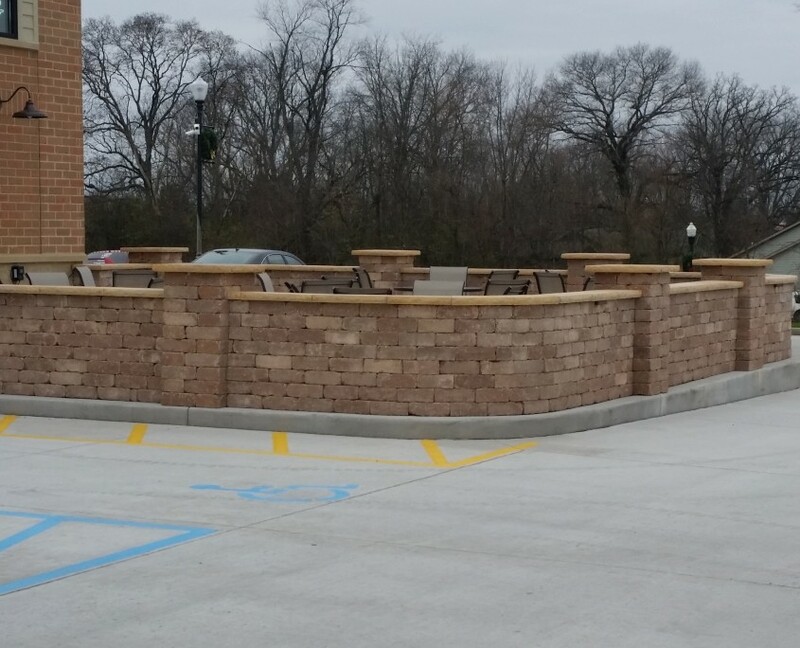 We installed a brick retaining wall to enclose the patio and separate the patio from the parking lot. This homeowner wanted to make real use of their backyard. 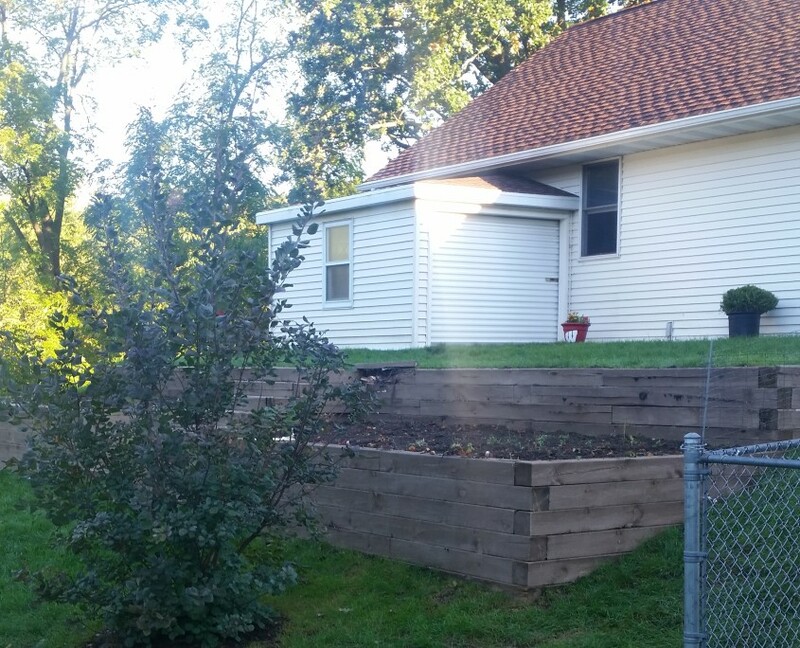 So we cleared away the vegetation and installed a terrace retaining wall. Now they have yard space and free room under their second level deck. 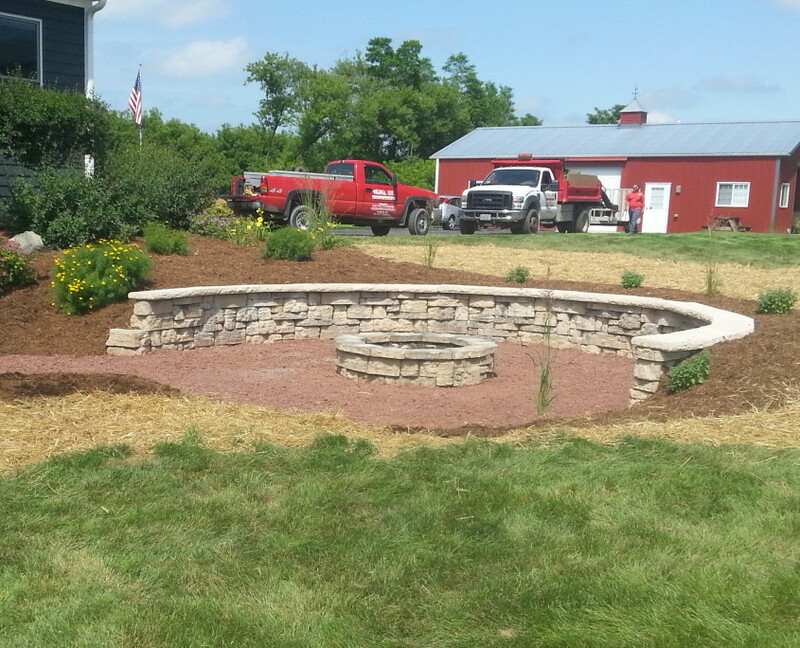 We installed a retaining wall fire pit with a surrounding wall for seating. 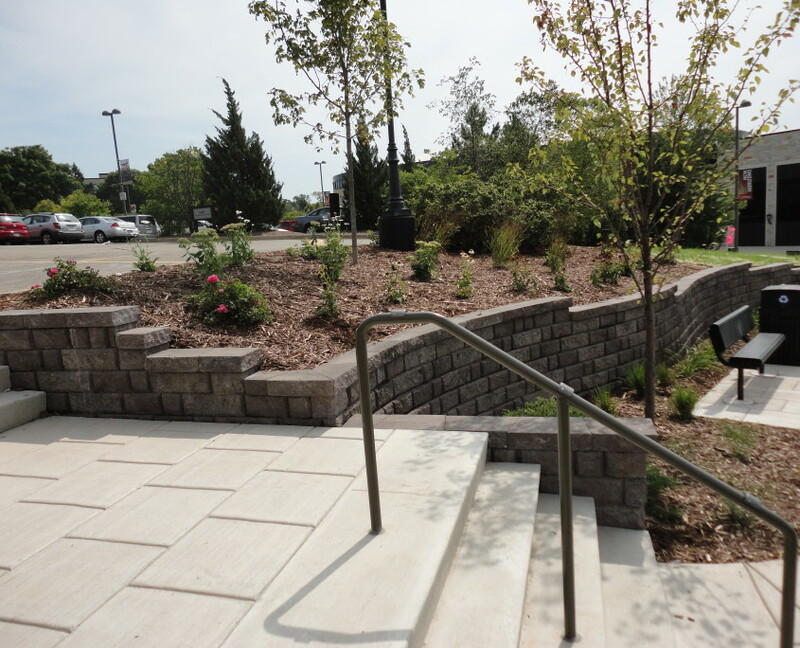 On top of that, we provided the landscaping around the walled area to ensure stability and add aesthetic appeal. 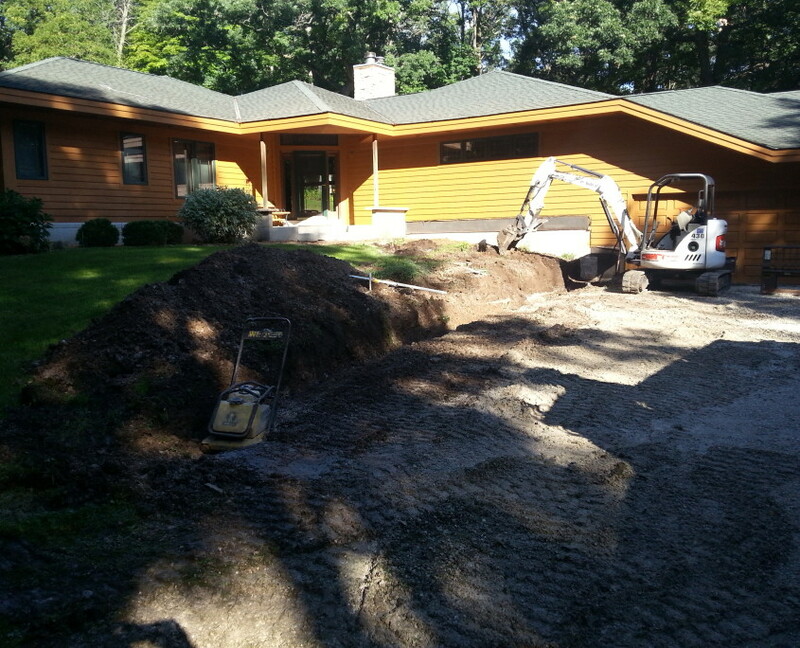 We removed the old, failing retaining wall next to this driveway and replaced it with a new cement retaining wall. 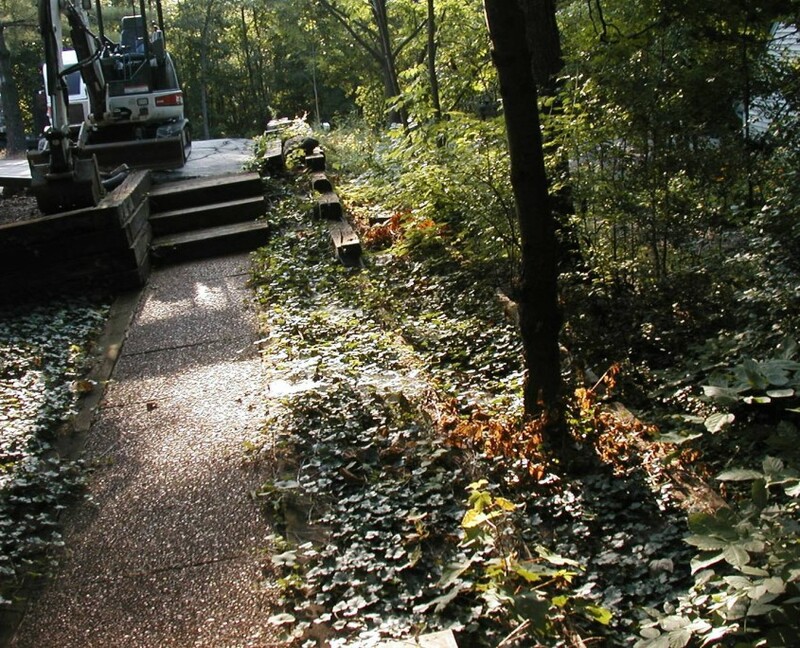 We also cleared away most of the vegetation next to the driveway, installed natural stone work to improve drainage, and planted seasonal flowers. This old wood retaining wall was looking a little worse for wear. 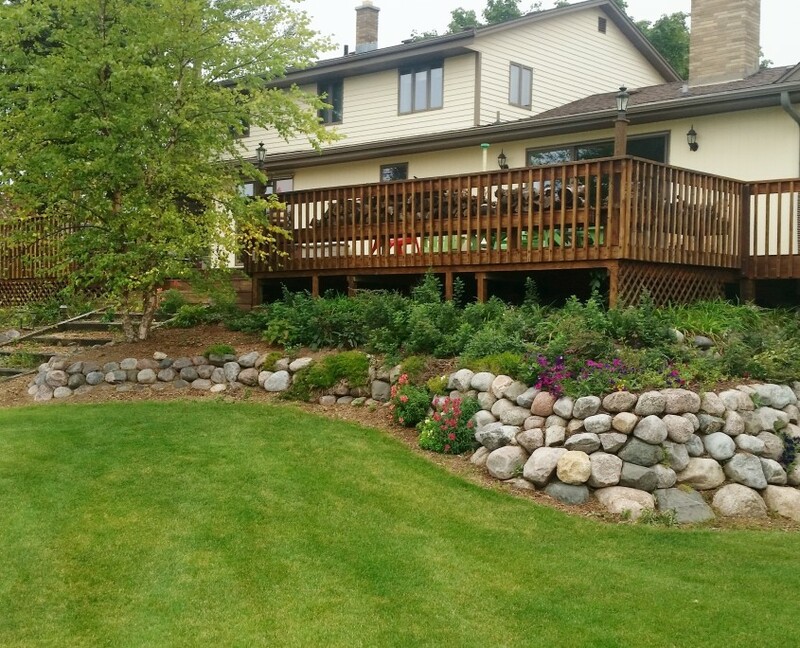 We replaced it with a natural stone retaining wall that looks great and will last for years. 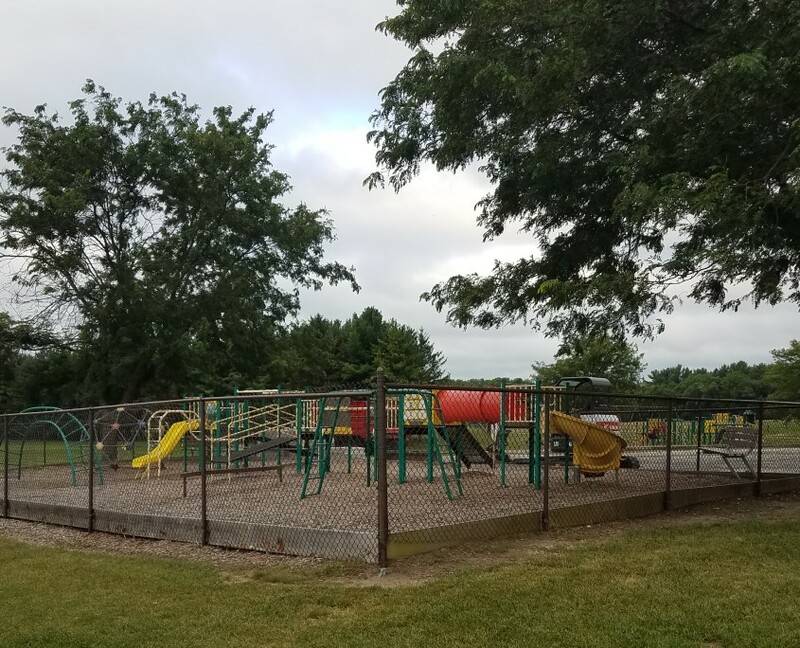 We installed a retaining wall that surrounds the parking lot of this commercial building as well as the small playgrounds they had. This homeowner wanted to install a patio in their backyard. With the back door positioned off the ground, the patio had to be elevated. 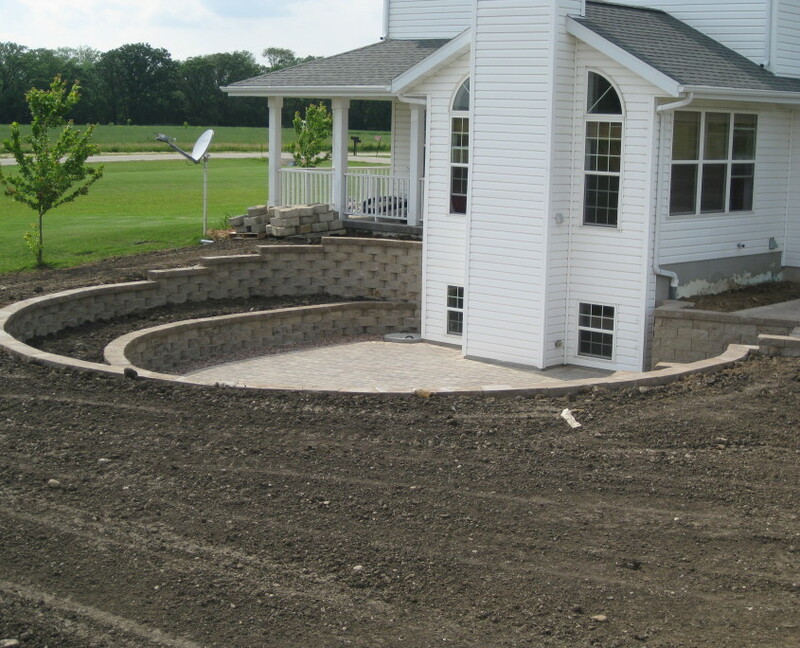 We installed a cement retaining wall to bring their new patio up to the right level. We also added brick pillars with metal railings to enclose the patio and keep it safe. 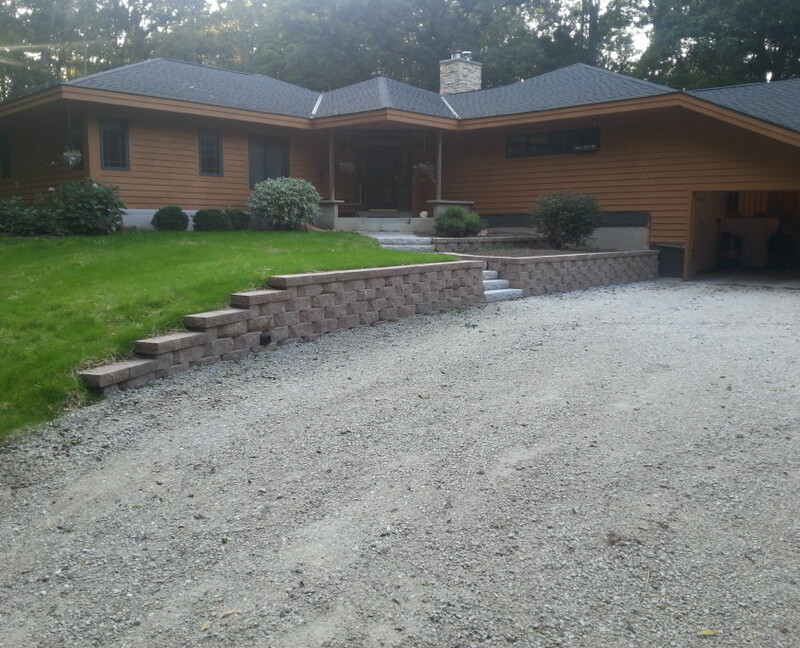 We replaced the old boulder retaining wall in the back of this house with pavers. The result was a terrace retaining wall that looks clean, properly accommodates the legs of their deck, and kept their garden and plant life intact. 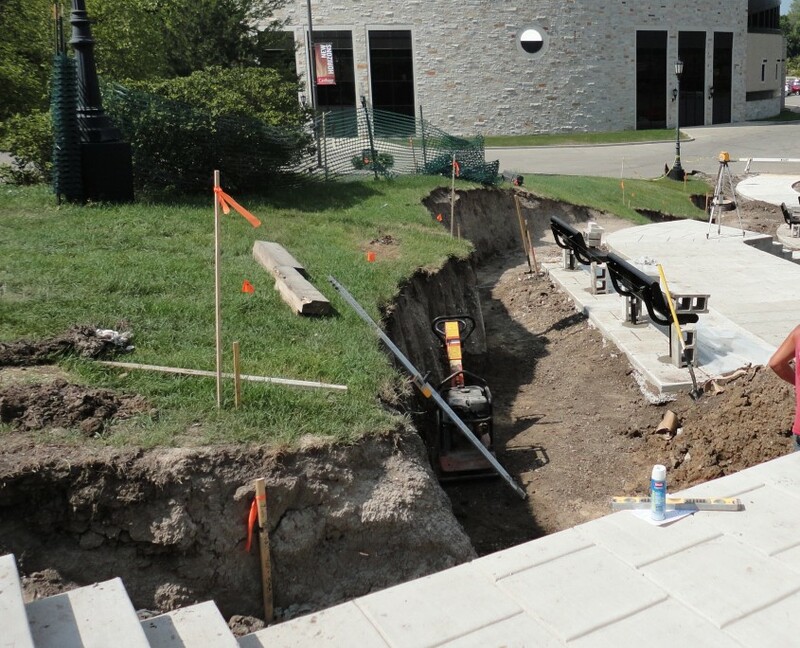 When Carthage College was installing a new sidewalk, they called Koch Kuts for retaining wall and landscaping services. We installed a concrete wall next to their steps and seating area. Then we planted new trees and flowers around the wall. 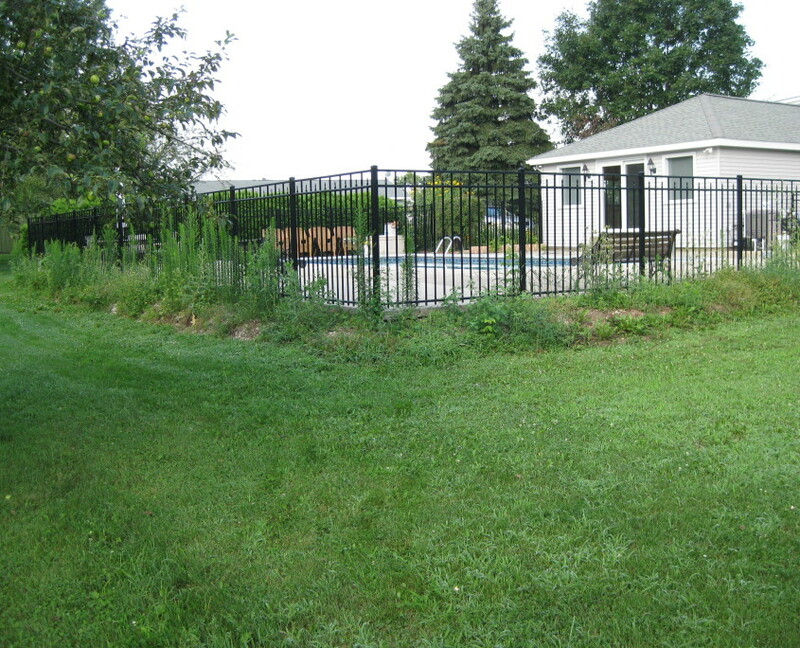 This is a great example of the difference a retaining wall can make. 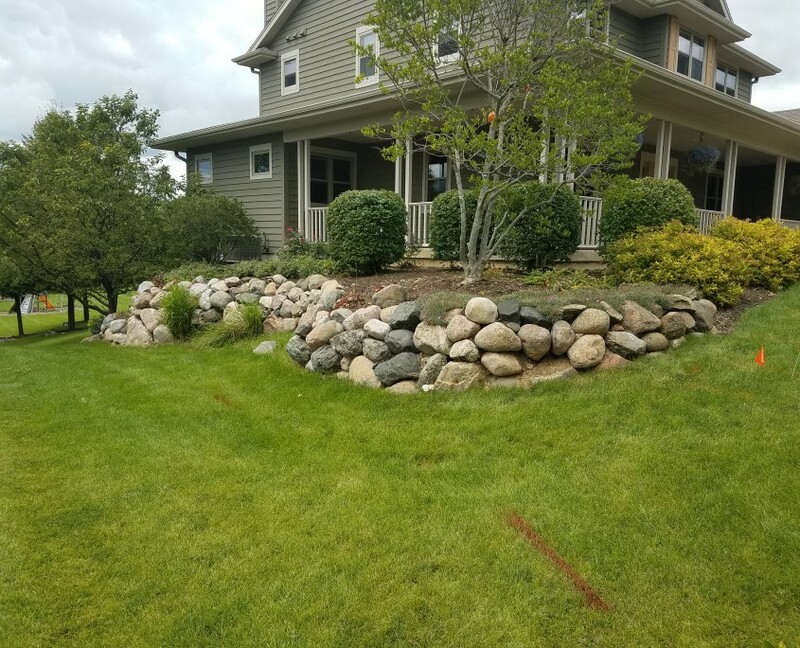 We installed a stone wall and additional steps at the entrance of this Waterford house; and then planted some shrubs to give their home a little more life. 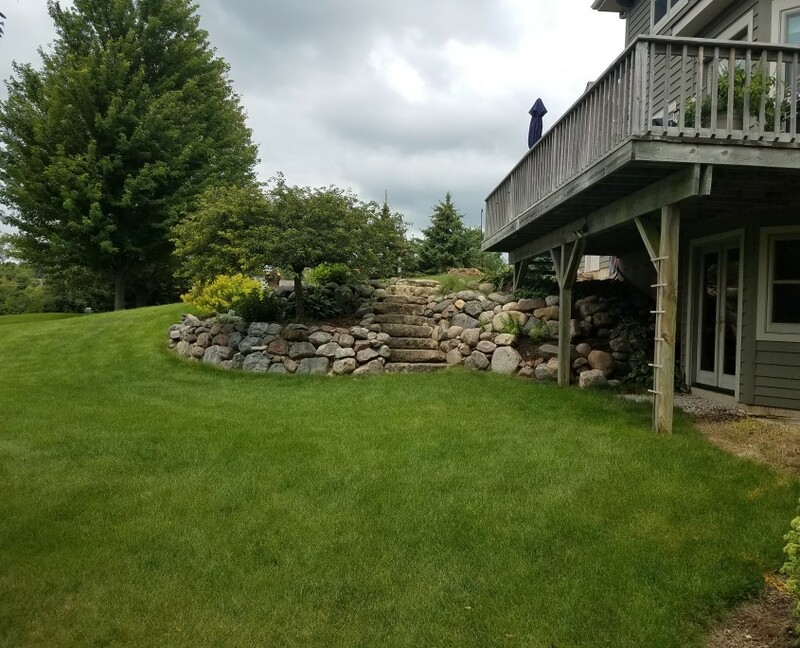 We replaced the old retaining wall next to their house and extended the wall into their backyard to add more space around their patio, improve their view, and eliminate landscape erosion. This was a fun one. 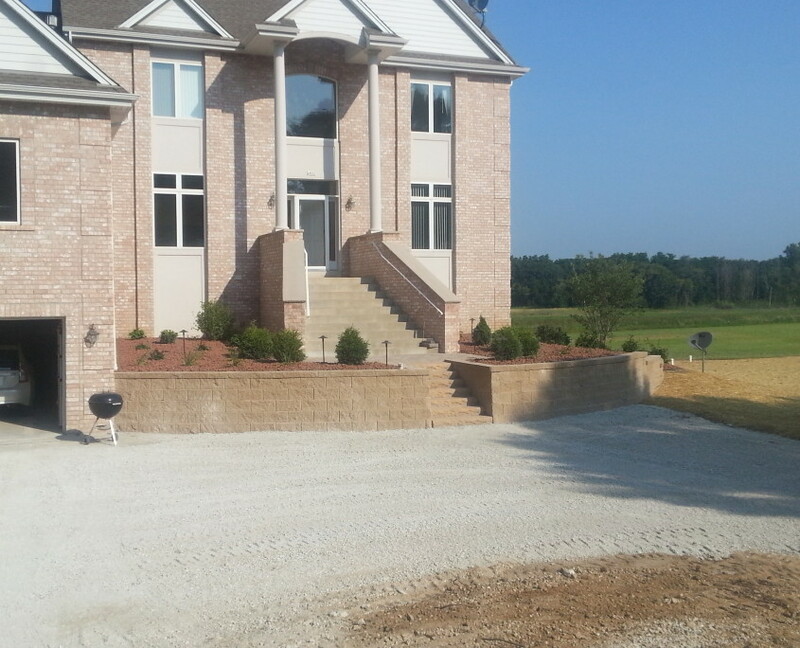 We installed three different retaining walls on this property. 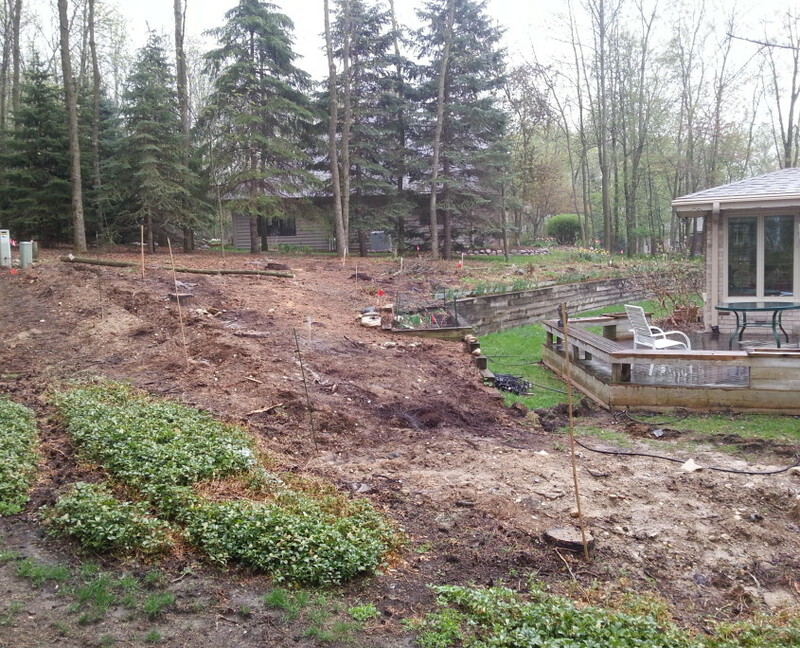 First we installed the concrete wall on the hillside in their backyard. 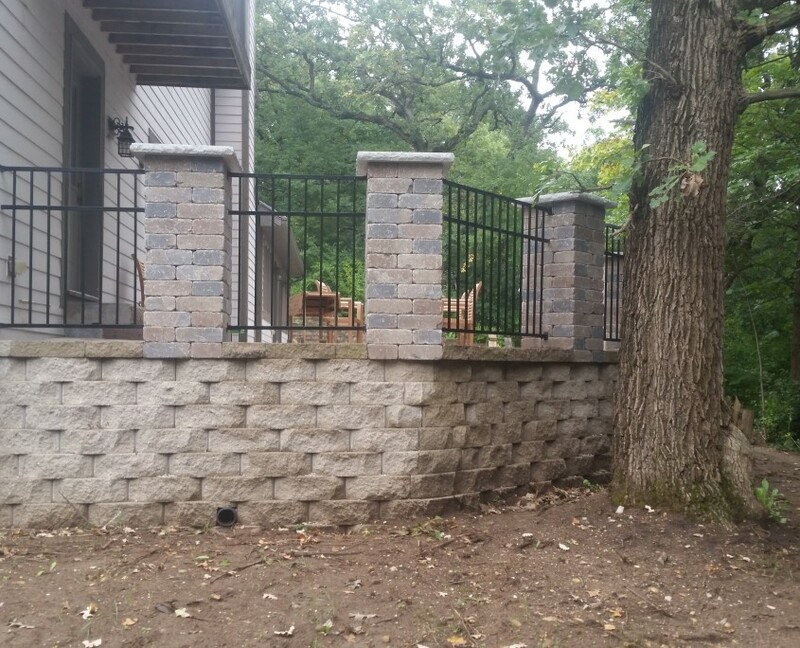 Second we installed a stone wall next to their house and patio. 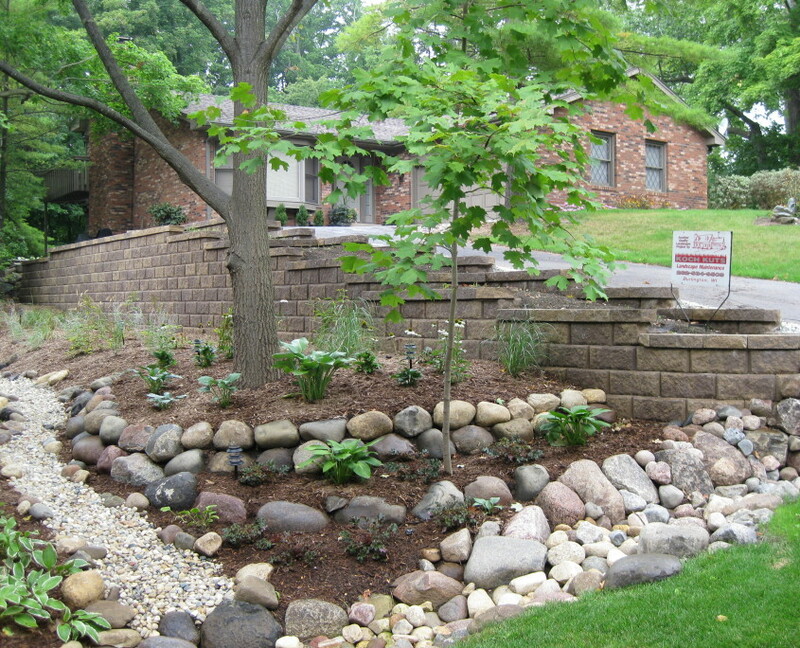 Finally we installed a boulder wall to protect the walkway and tree on the side of their house. 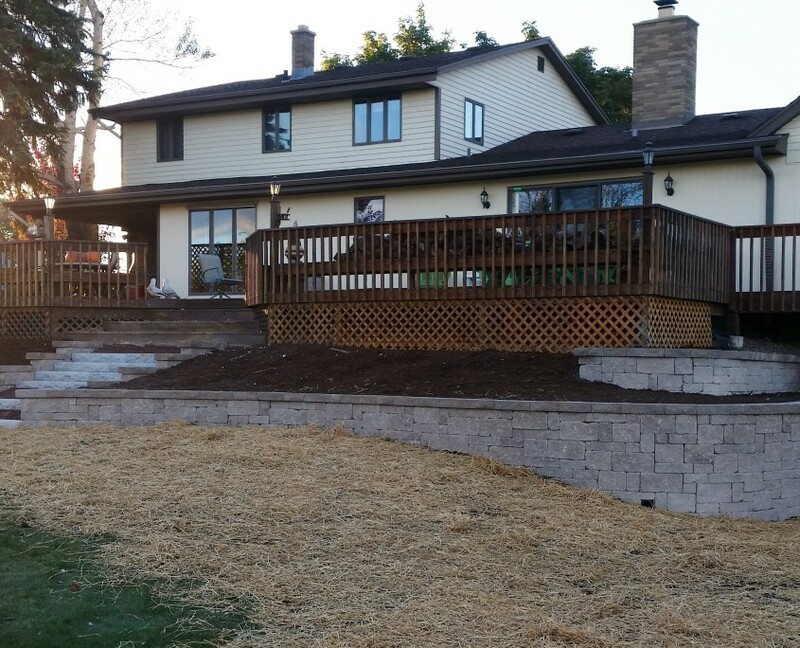 The builder on this new home project brought Koch Kuts in to install a patio, retaining wall, and steps under the deck of this house. Of course we provided landscaping too. 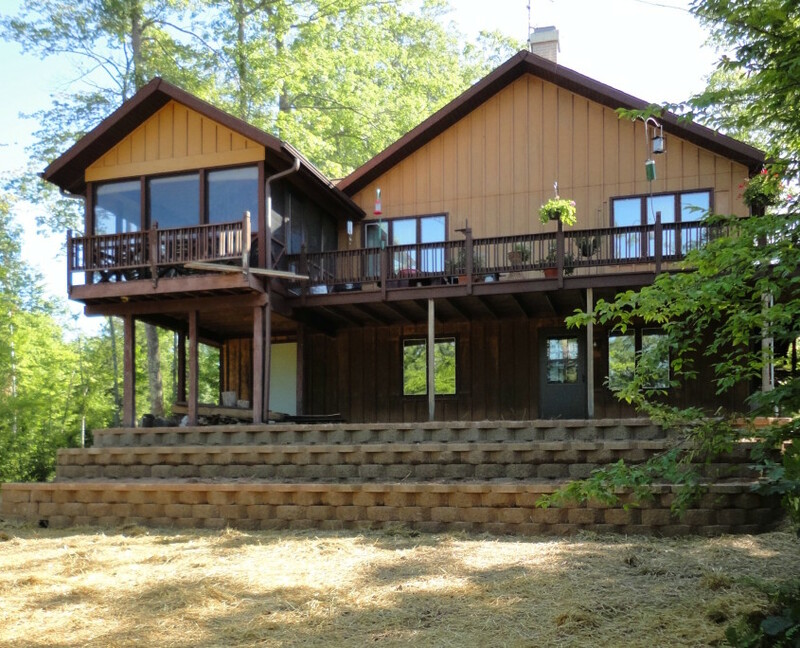 Looking to put the finishing touches on your home and property? 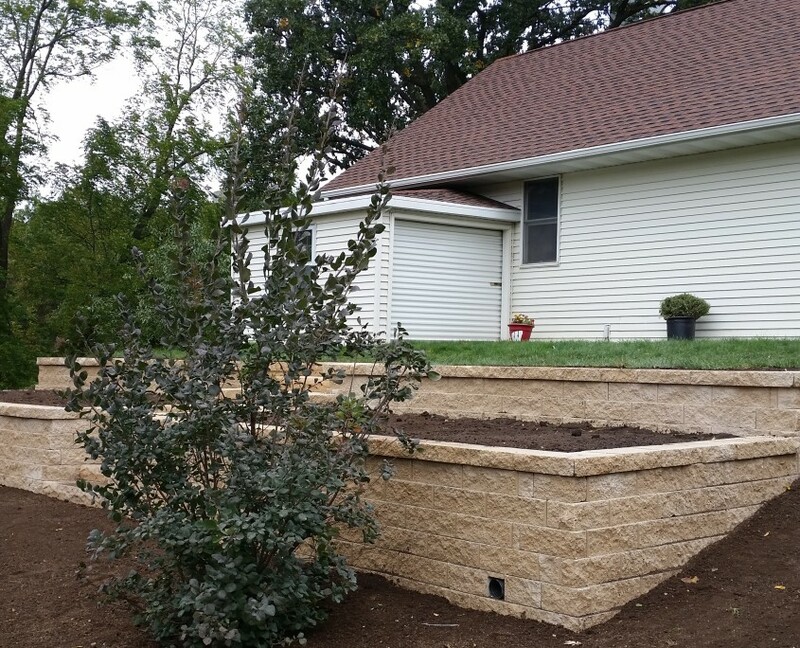 A retaining wall may be the hardscape feature you’re missing. 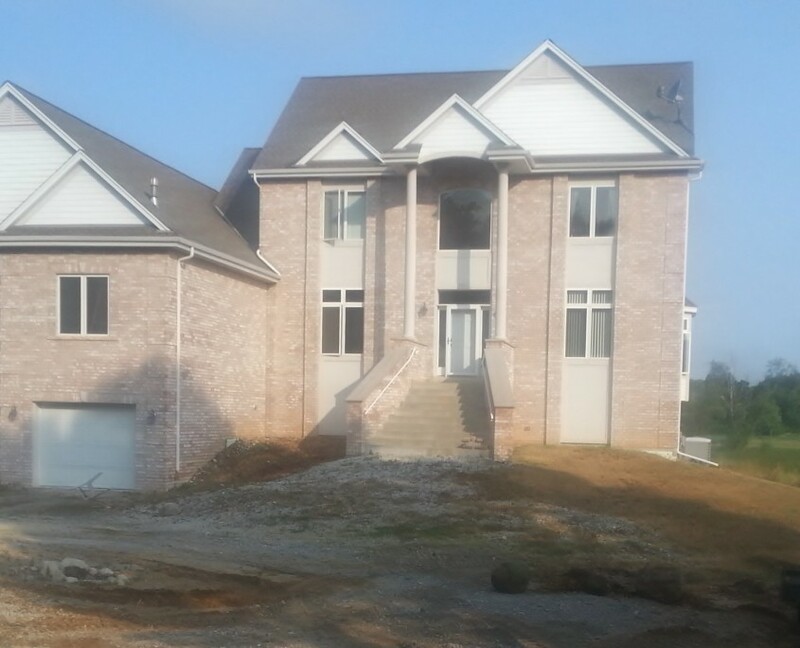 For this home we installed a retaining wall next to their driveway with stairs to their front door. 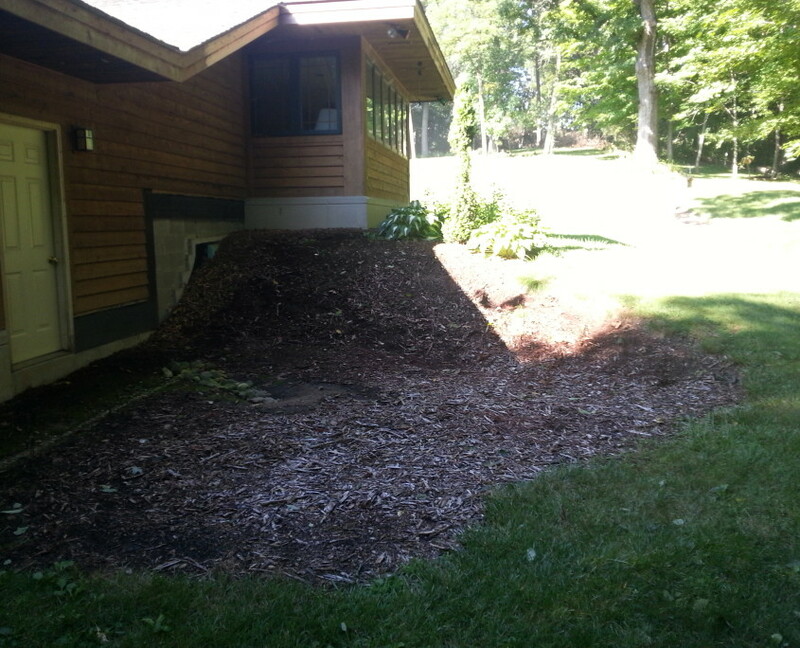 The wood wall around this tree and flower bed was in poor condition. 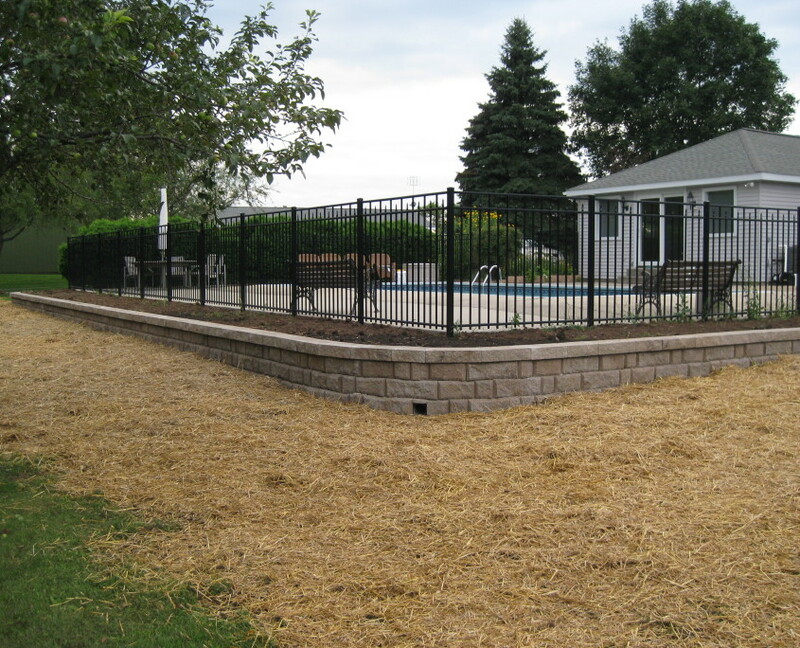 We installed a custom wall to enclose and protect their plant bed. 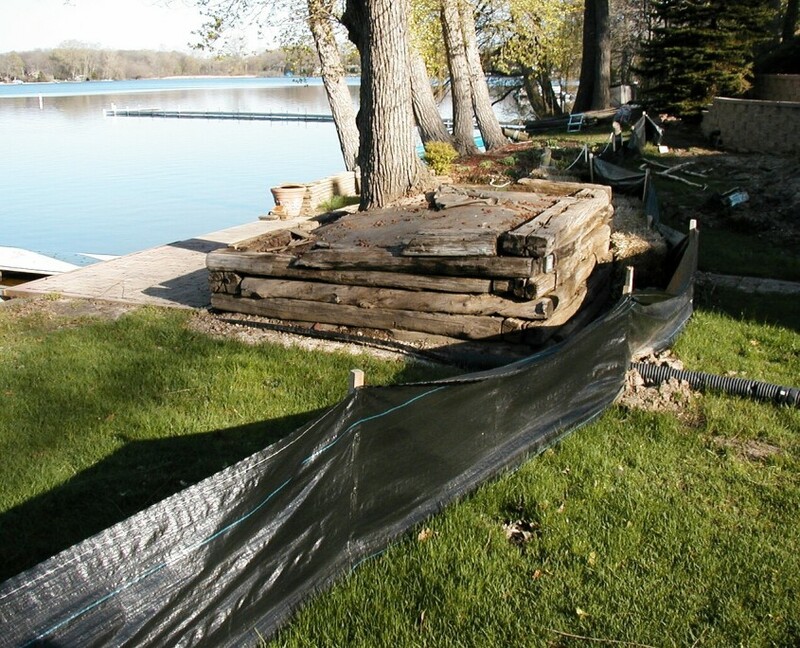 Wood used to be a popular choice for retaining walls. All of those walls are now being replaced with a better looking, longer lasting solution – like stone, concrete, or brick. 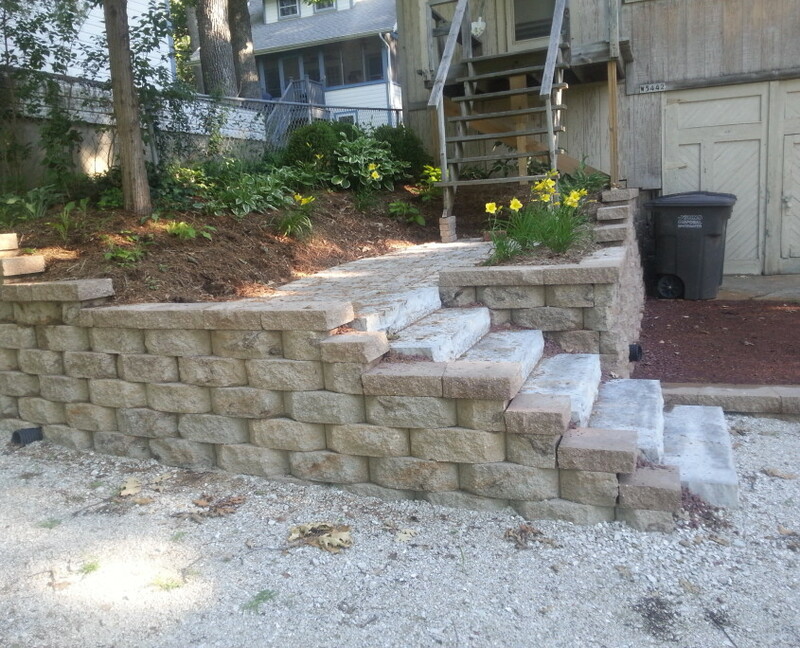 We replaced the terrace retaining wall on this hillside with concrete blocks. Wow, the difference good hardscape work can make. 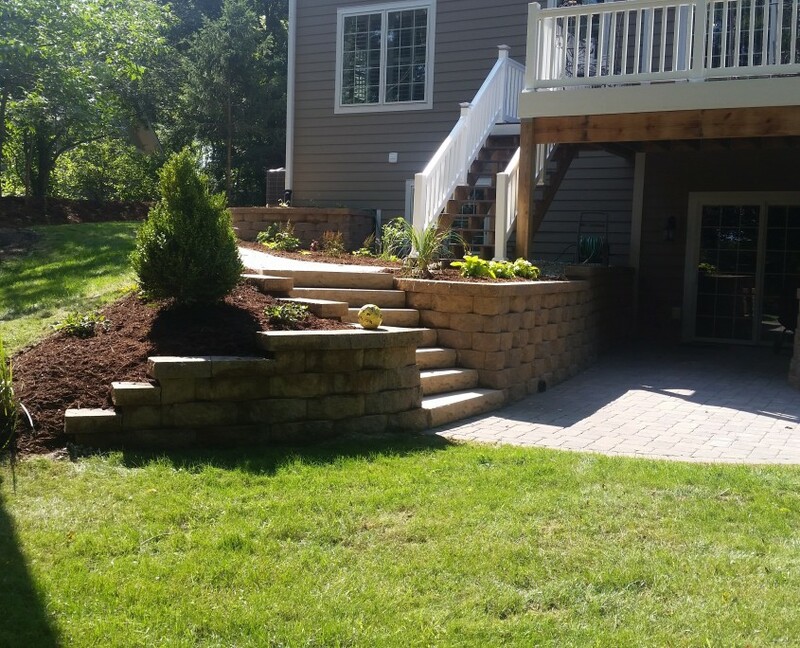 We replaced the walkway and stairs in front of this house and installed retaining wall to prevent landscape erosion and improve curb appeal. 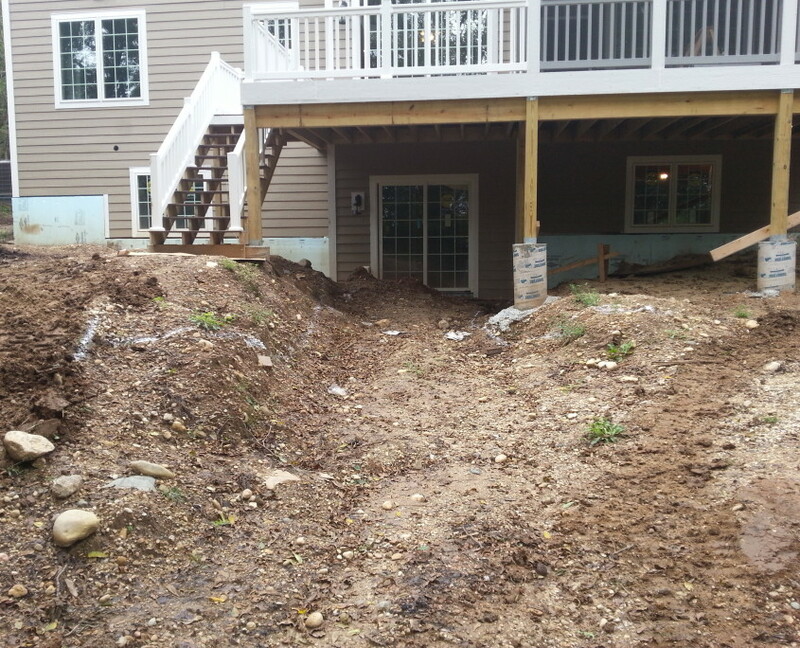 The slope next to this house was causing drainage problems. 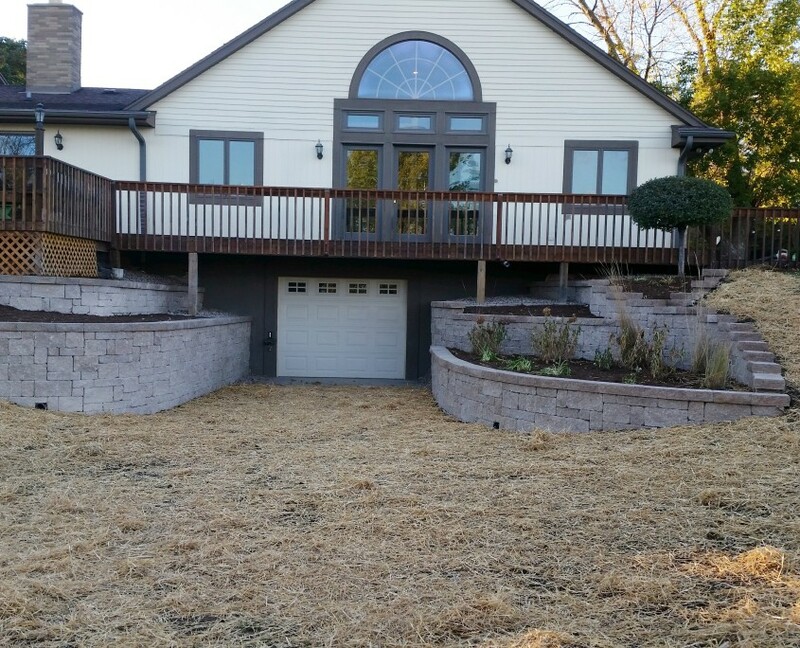 We installed a small concrete retaining wall that looks great and effectively drains the area when it rains. 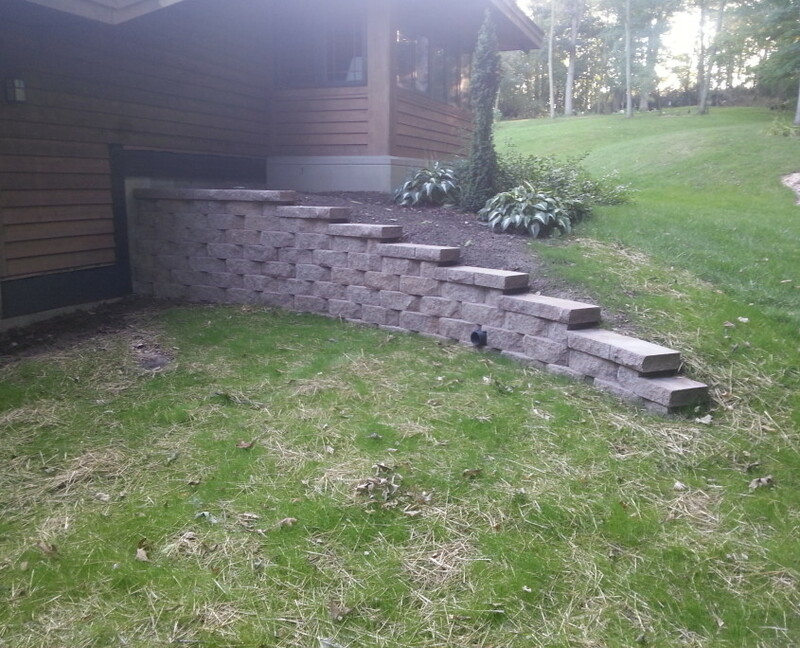 We replaced the boulder retaining wall as well as the wooden steps from their deck to backyard. We used natural stone on the new steps and concrete bricks to build the terrace wall. This was a special project. 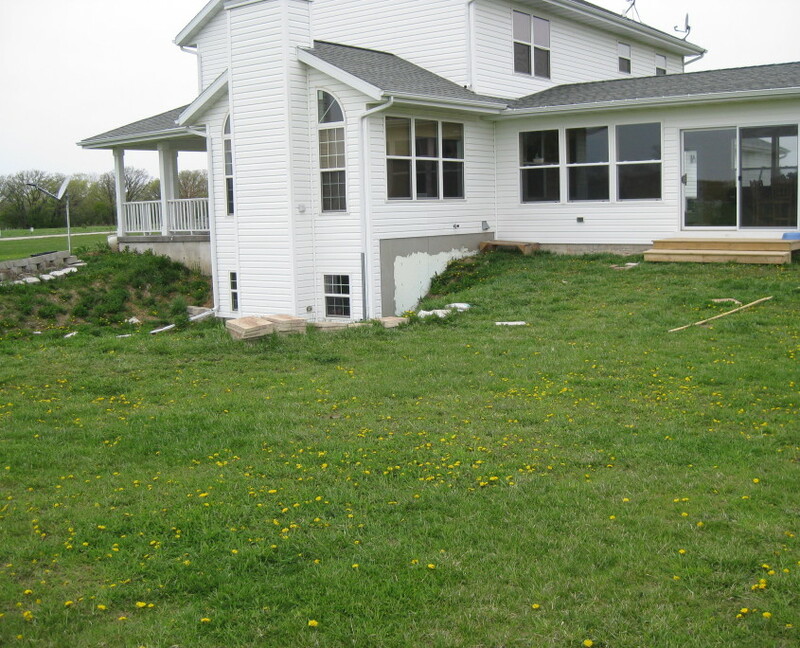 The landscape next to this house was an unappealing mess. 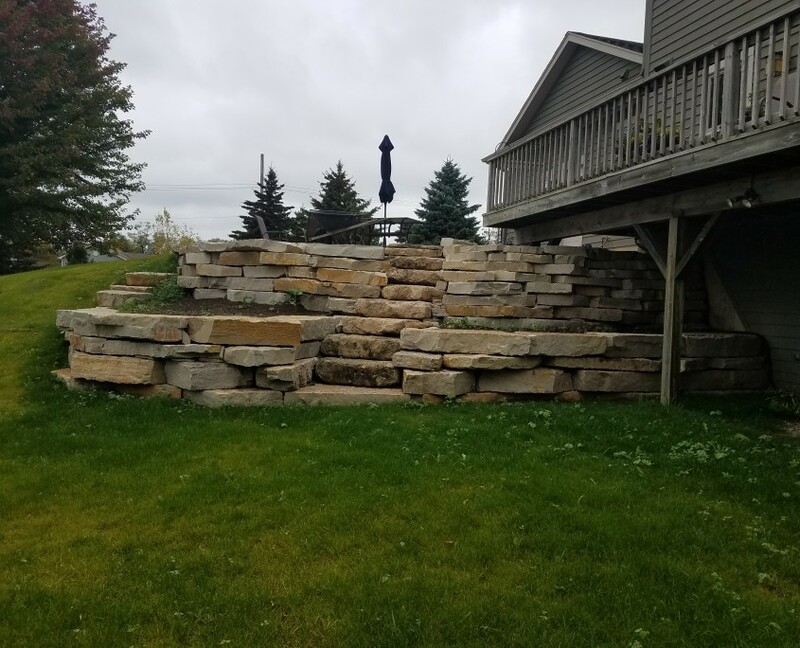 We designed and installed a patio surrounded by a terrace retaining wall (that can double as seating), and added steps to a second patio next to their sliding back doors. 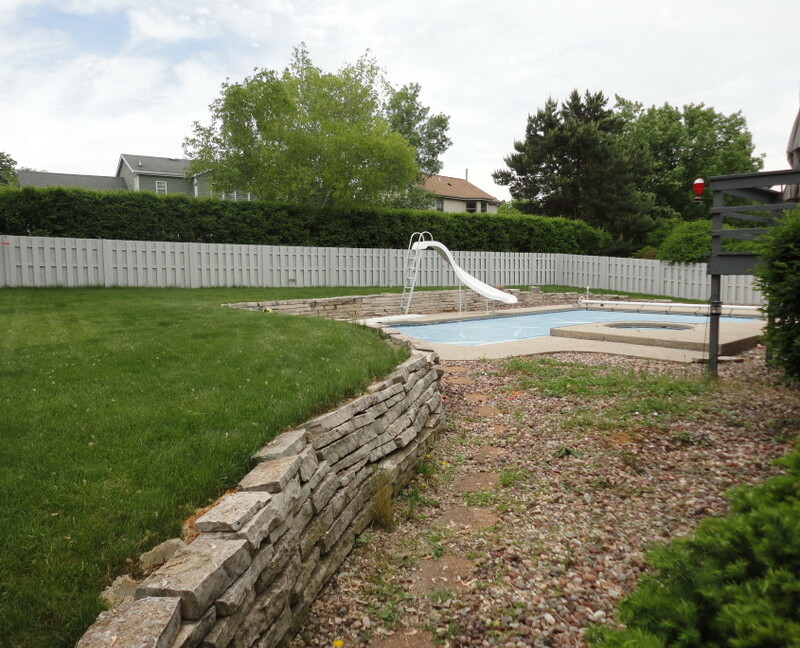 The before picture on this project speaks for itself. 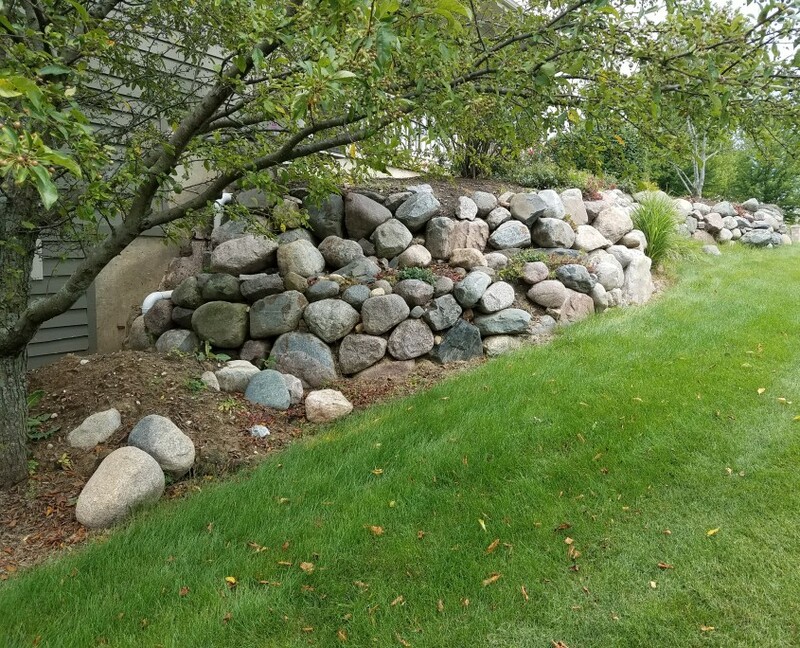 The new retaining wall greatly reduces landscape maintenance, improves the yard’s appearance, and most importantly, improves drainage. You can see where the blocks on this old retaining wall were starting to fall off. 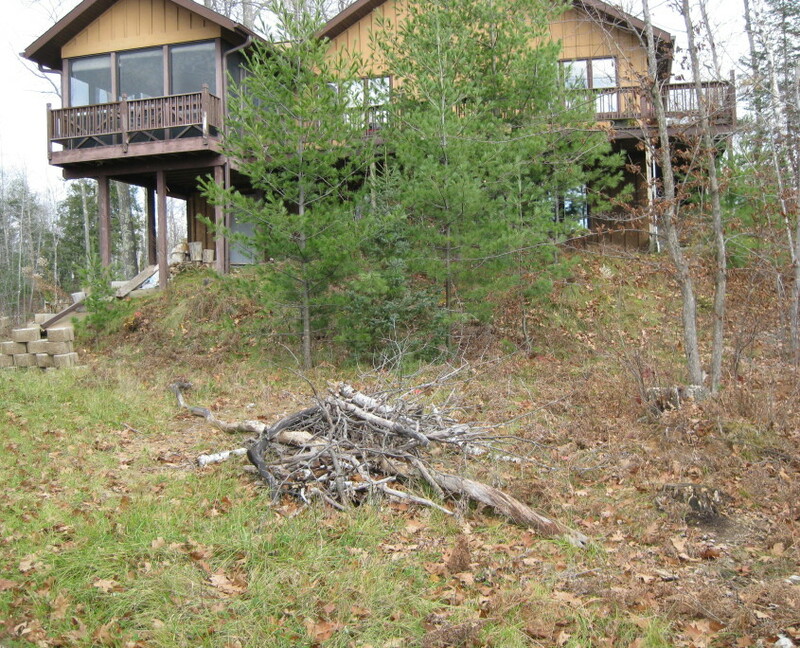 Most notably is the left side of the middle row that has completely collapsed due to landscape erosion. 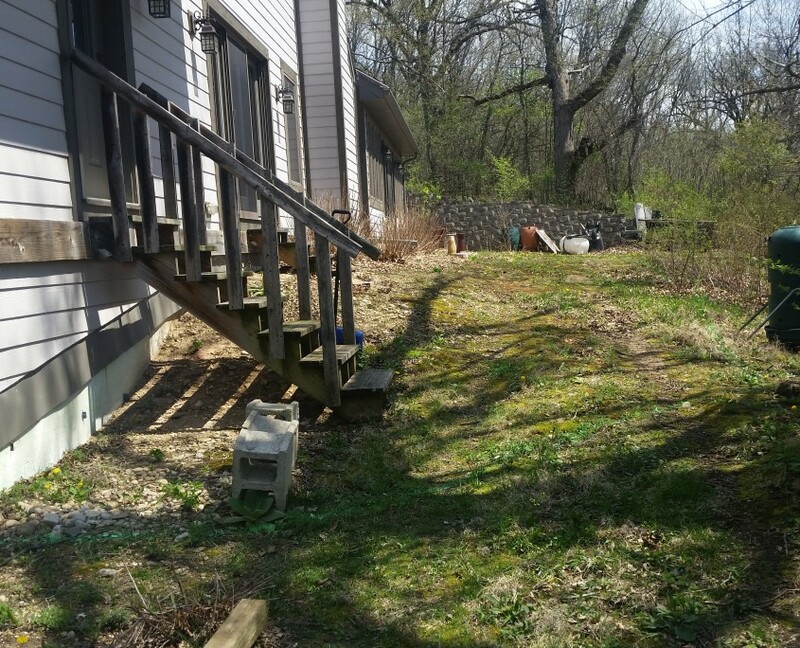 We restored the wall and steps of this hillside retaining wall and seeded the yard for healthy growth come spring. 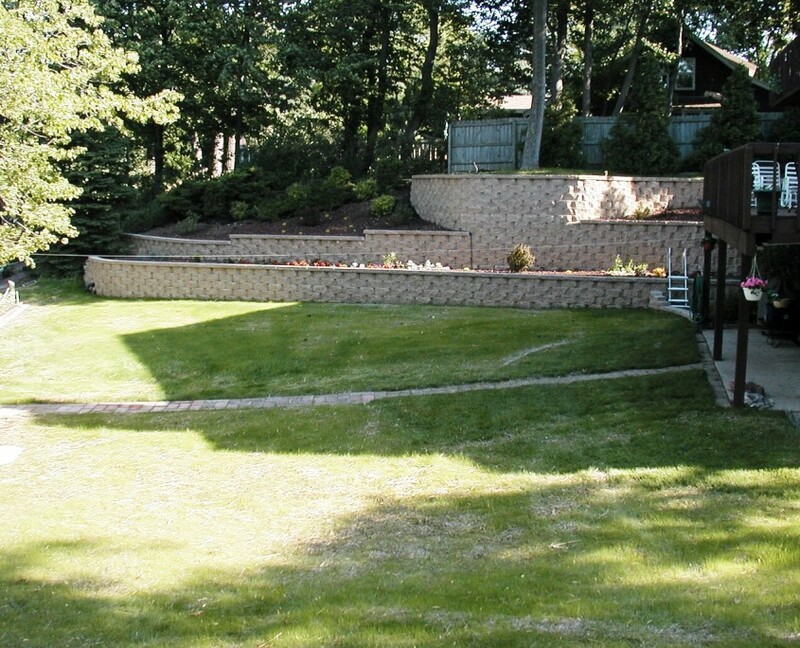 Contact Koch Kuts for a free retaining wall estimate.